I read this article and found it very interesting, thought it might be something for you. The article is called Seed Catalogs and a Hot Beverage and is located at http://www.gardendish.com/winter-reading-seed-catalogs/. Is gardening part of your vegan lifestyle? 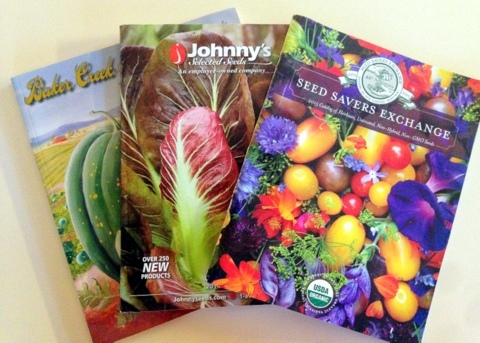 Do you jump for joy when a shiny, new seed catalog arrives in your mailbox? Does the perfect “me” time in the dead of winter involve sitting down with a good seed catalog and your favorite hot beverage? Seed Savers Exchange – According to their website, the mission of Seeds Savers Exchange is “to conserve and promote America’s culturally diverse but endangered garden and food crop heritage for future generations by collecting, growing, and sharing heirloom seeds and plants.” That sounds like a noble mission to us. We find their catalog contains loads of heirloom plant offerings – along with fascinating stories, plenty of growing information, and pictures that help you select varieties. Baker Creek Heirloom Seeds – The catalog from Baker Creek Heirloom Seeds is full of the most beautiful pictures – often of very hard-to-find plants. It can take days to peruse this bountiful catalog. If you love to garden, we think you’ll love this catalog. 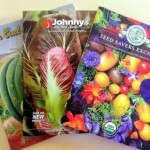 Johnny’s Seeds – Johnny’s Seeds targets the direct-to-market grower – think farmers’ markets. But if you’re “just” a home gardener, don’t let that stop you from requesting this catalog. Have you ever wondered what the average yield of bush green beans is from a 100′ row? Or what the germination rate per degree of temperate looks like for winter squash? You’ll find that kind of interesting information in the Johnny’s catalog. There are many more seed companies from which to choose when it’s time to order. Some have excellent online ordering sites, making it easy to compare varieties. We’ll discuss those aspects, and our recommended sites, in a future post. Until then, go ahead and order the catalogs above. Then enjoy a good, winter’s read with a hot beverage. If you have a favorite seed catalog that makes you jump for joy when it arrives in your mailbox, please share it here. Vegan gardeners everywhere will thank you.